Above the display in portrait mode, you will find the 1.6MP front-facing camera and one of the BoomSound stereo speakers. The other one sits below the display. There is nothing on the left side of the tablet. The power/lock key, a microphone pinhole, and the volume rocker sit on the right side. The 3.5mm audio jack sits on top of the tablet. The microUSB port and a tiny microphone pinhole are on the bottom. The back of the device features an 8MP main camera and its single-LED flash - they are located in the top left corner. The signature Nexus logo is there too, accompanied by a small HTC badge. The HTC Nexus 9 features a robust 6,700mAh battery. The tablet is quoted at up to 9.5 hours of Wi-Fi browsing, the same amount of time in video playback, and up to 30 days of Wi-Fi standby. Naturally, we put the Nexus 9 through our own battery test. 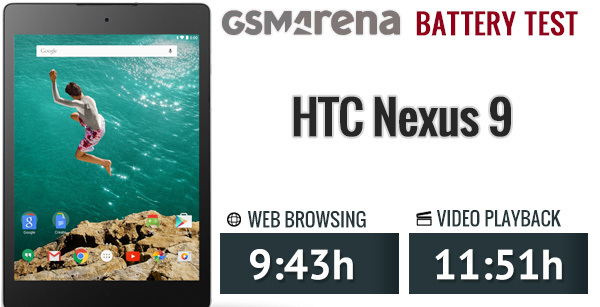 The tablet managed almost 12 hours of video playback and close to 10 hours of web browsing. Battery saver mode is available for the moments when you want to conserve your tablet's power. It reduces the tablet's performance and restricts background data. You can tune it to turn on automatically or switch it on by yourself. The lockscreen of Android 5.0 Lollipop shows the time necessary for the battery to charge. Nexus 9 takes a tad over three hours to fill up from 15% remaining with the bundled charger. 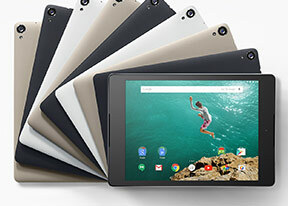 The HTC Nexus 9 offers a rich connectivity set, headed by optional quad-band GSM, CDMA, penta-band HSPA, and 4G LTE. Wi-Fi a/b/g/n/ac, Bluetooth 4.1 with aptX, NFC, A-GPS, GLONASS, and microUSB 2.0 are also on board. You can also cast the tablet's screen to a compatible device. There's nothing major missing in the Nexus 9 in terms of available connectivity. IR port would have surely been sweet but, to be fair, it's never been a Nexus family staple.